Friday - 2/1/19... "Find your Level February"
Our monthly Challenge Series has been updated for February… this month we’re challenging people to find their overall level using The Level Method. Anyone who’s been around the gym for the last couple of months should have noticed the giant periodic table of fitness that been tacked to the wall. It’s 8’ x 4’ and is all types of different colors. It has workouts, words, flow-charts, etc…without getting to detailed it’s meant to provide an overall assessment of our current fitness level. It uses color rankings similar to Brazilian Jiu-Jitsu and overall it has 15 different categories that get tested. The goal is to test each category and establish a ranking….it is very possible that some people might be a ‘Black Belt’ in one category and an ‘Orange Belt’ in another. After testing each category we are then assigned an overall level...which will be limited by our weakest links. It should give people a clear snapshot of their strengths as well as areas where we can improve. Throughout the next month we’ll be incorporating the testing into our regular programming. If anyone is interested in finding their overall level you should goto: strongtown.levelmethod.com and use the code ‘Strongtown’ to setup your account. Monthly attendance reports have been run and we saw 155 more check-ins in January than we did in December! That says a lot since December was one of our busiest months. Congratulations to everyone who made January’s Finest, to make the list you must have attended 15 Classes, Open Gym sessions, or Beer WODs throughout the past month. An honorable mention is given to anyone who was 1 class shy. Bob and the Noon class - Round 1 on the bikes. 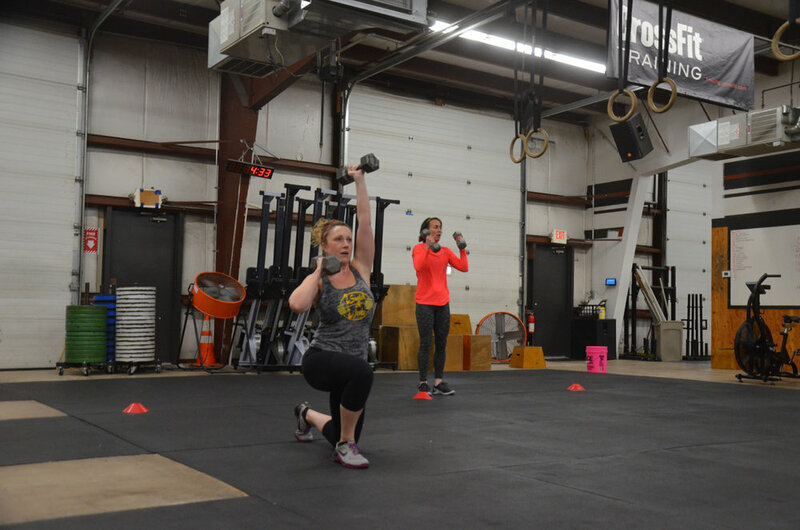 Stacy looking strong on her lunges! 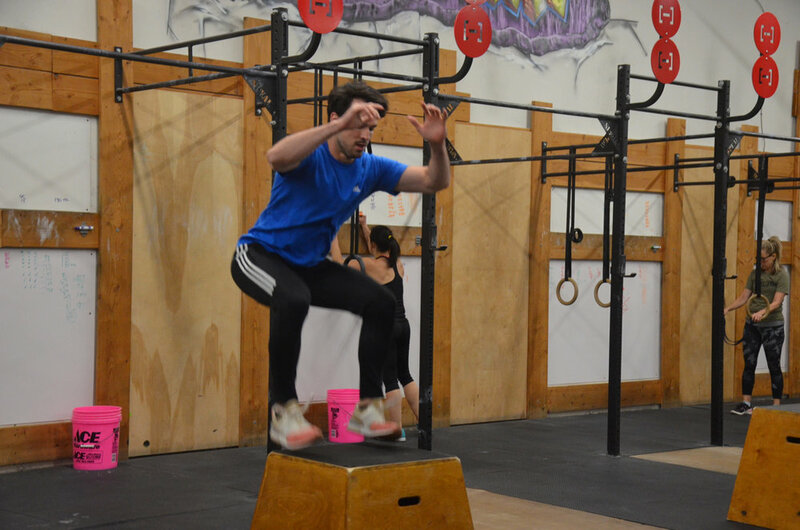 Angel flying through his box jumps.